Home > Used Vehicles > 2018 Subaru Outback 3.6R Touring,AWD,SUNROOF,BACK UP CAMERA,BLUETOOTH,HEATED SEATS,HEATED MIRRORS,,CARPROOF IS CLEAN!!! 2018 Subaru Outback 3.6R Touring,AWD,SUNROOF,BACK UP CAMERA,BLUETOOTH,HEATED SEATS,HEATED MIRRORS,,CARPROOF IS CLEAN!!! On Sale! Save $2588 on this one, we've marked it down from $35888. 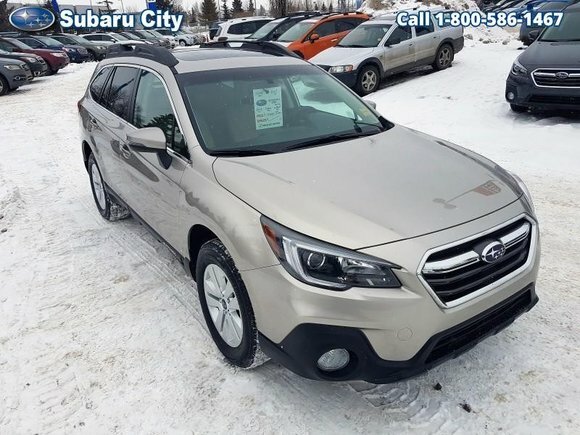 This 2018 Subaru Outback is for sale today in Edmonton. More than just a wagon, the 2018 Subaru Outback is an intriguing alternative to a traditional midsized SUV. It has more cargo space than most larger competitors and less thirst for fuel. Functionally, it does everything most midsized SUVs can do and more. This low mileage coupe has just 8700 kms. It's tungsten metallic in colour. It has an automatic transmission and is powered by a 3.6L H6 24V MPFI DOHC engine. It has some remaining factory warranty for added peace of mind.